Toyota Prius: I've had two of them and I really like the way the interior is set up. Reliability and low maintenance costs a big plus too. Everything you are looking for, you are describing in the Prius. You love what you know. And you enjoyed your past experience with the Prius. Space efficient, fuel efficient, cost efficient, and reliable. Everything you want is where it needs to be. The Prius checks off everything you want. The audio/nav system in the Prius, is marginally acceptable at best. IMO, any audio system is good enough. But, the Prius does give you an option of upgrading to the premium JBL system with tweekers and multiple speakers. Some people say that the system is underwealming. Unless you are an audiophile....you aren't likely to care. The navigation system...is meh. Let's face it...Google Maps has this down pat. The second best thing to it would probably be Garmin. Unfortunately, the Prius doesn't come with Mirrorlink, Carplay, etc. You are stuck with their sometimes annoying GPS system. It has gotten better since the previous gens, by not by a significant enough stretch. 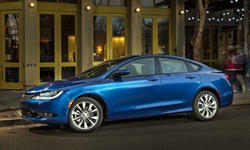 The most well layed out dash/audio/nav system in the range of what you are looking for is likely the Chrysler 200. You likely didn't even consider it. It has less space than the Prius for pax. That owes to the coupe-esque styling. However, the trunk is carnaverous. You can stuff so much in there. The interior is beautifully designed, and it harmonizes with the outside. 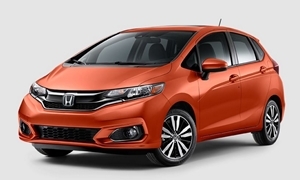 The Honda Fit is a safe, but solid choice. Small, but utilizes its space very efficiently. The drawback as you is the audio control. You didn't like the Fusion's layout...you may hate the Fit even more. Test drive it, and see how fustrating it can be driving in traffic trying to tap up or down to control volume. If you can get past that...then its a great car. Also consider: Mitsubishi Lancer, Subaru Outback. Good choices. 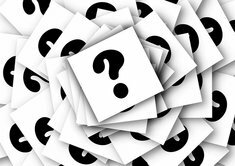 Considering your budget is at 40k, you can pretty much buy any car. Even entry level luxury would be in question. I would advise you to pick the one you like best...and get the highest optioned version of it. Make yourself comfortable, its going to be your car for awhile. The Honda Fit is the best combination of interior space and economy for a relatively low price. You'll pay more for less cargo space for a Prius, but get even better fuel economy. 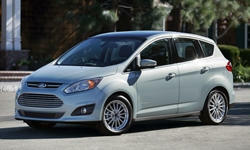 Ford also offers a hatchback hybrid, the C-MAX. It's not as reliable as a Fit or a Prius, but I personally like how it drives much better. 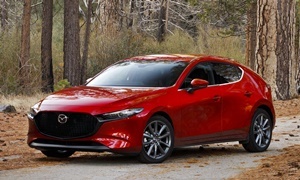 If you want a sportier driving experience than any of the above, also check out the Mazda3 and Volkswagen Golf. The latter feels impressively solid. A final, somewhat oddball option is the Kia Soul. 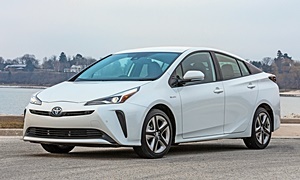 Reliability, durability, fuel efficiency, cargo room: Prius. The Prius has much more cargo room than a Honda Fit. Look at the cars or look at the specs. A used Prius comes at a smaller premium in price, and they laaaaaaaast. I like driving the Volkswagen Golf, but would only buy the diesel (for mpg) and actually-- I wouldn't buy it. I've owned several, and they needed too many repairs.